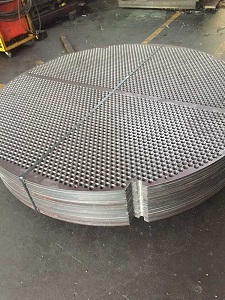 In the tube plate of the detection process, the main measure is the hole position, hole tolerance and inner hole finish, without burr, pull the groove position and so on, for double tube plate, detection in the process of pay more attention to holes, two pieces of tube plate hole cooperation is very important. General CNC drilling machine can be guaranteed. With respect to the plate, 300mm above the hole, the perpendicularity of the hole is very important, these large diameter thick and need more sophisticated tools and equipment and special gantry machining center applications will be more and more common. Mainly used in chemical containers, such as shell and tube heat exchanger, pressure vessel, boiler, condenser, central air conditioning, evaporator, water desalination of the supporting column fixed tube, metal material the not only has strong rigidity, but also has good heat conduction performance.